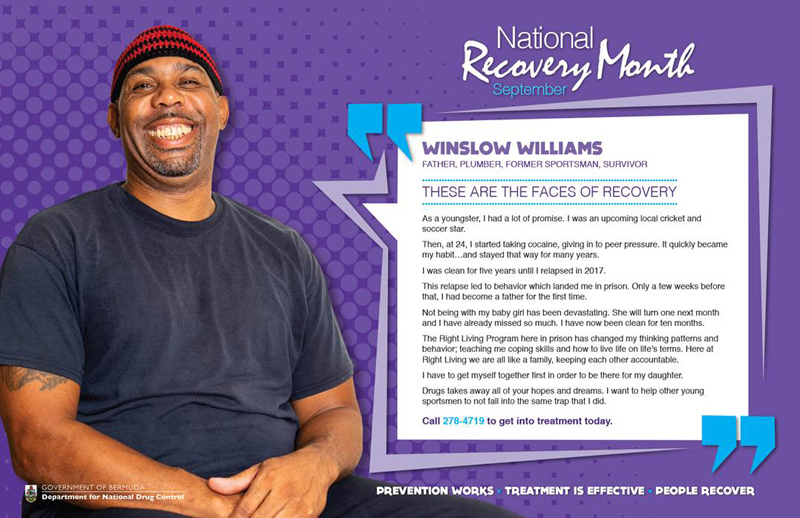 Olympic medalist Clarence Hill, Fitzgerald Richardson, Lance Tucker, Winslow Williams, and Nicole Fox are all featured on posters celebrating those in recovery for Recovery Month, delivering messages like letting those struggling to know that there is a way out and urging people to get help if they need it. Yesterday, Minister of Social Development and Sports Michael Weeks joined others in officially launching Recovery Month with a tree planting ceremony at the Arboretum, and as part of Recovery Month, the Department for National Drug Control and the Department of Communications, created the posters below, celebrating those in recovery. 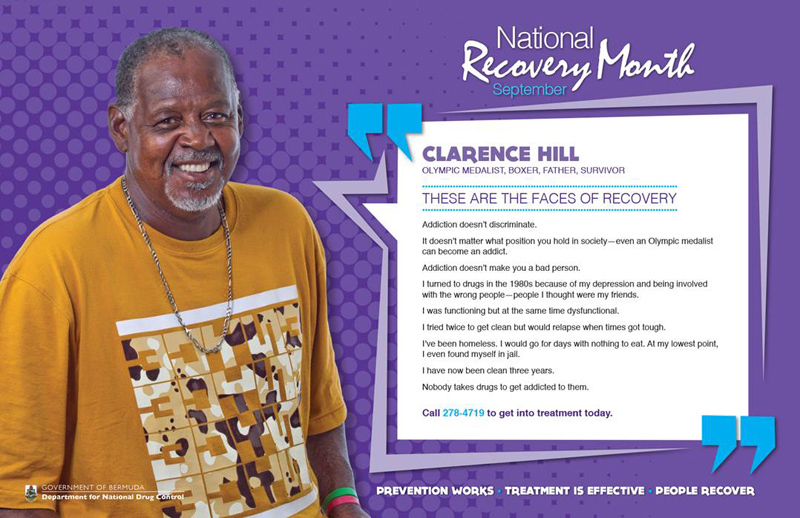 Olympic medalist, boxer, father, and survivor Clarence Hill said, “Addiction doesn’t discriminate. It doesn’t matter what position you hold in society – even an Olympic medalist can become an addict. “Addiction doesn‘t make you a bad person. I turned to drugs in the 1980s because of my depression and being involved with the wrong people – people I thought were my friends. “I was functioning but at the same time dysfunctional. I tried twice to get clean but would relapse when times got tough. 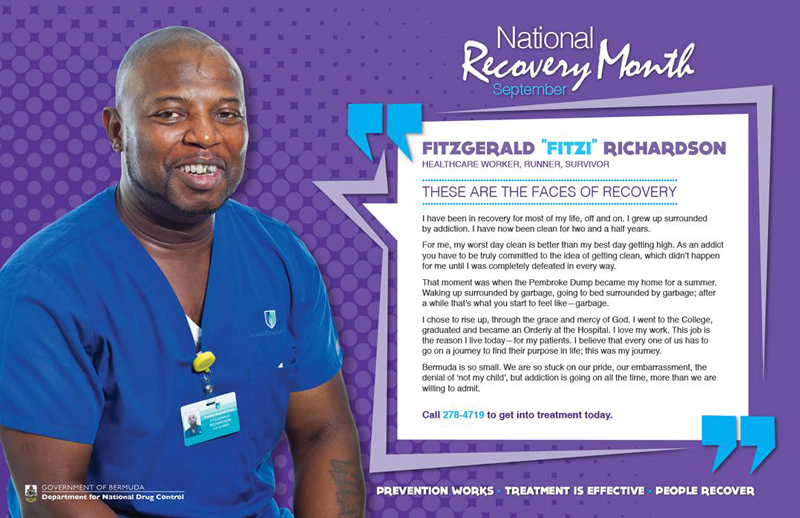 Healthcare worker, runner, and survivor Fitzgerald “Fitzi” Richardson said, “I have been in recovery for most of my life, off and on. I grew up surrounded by addiction. I have now been clean for two and a half years. “For me, my worst day clean is better than my best day getting high. As an addict you have to be truly committed to the idea of getting clean, which didn‘t happen for me until I was completely defeated in every way. “That moment was when the Pembroke Dump became my home for a summer. Waking up surrounded by garbage, going to bed surrounded by garbage; after a while that’s what you start to feel like-garbage. “I chose to rise up, through the grace and mercy of God. I went to the College, graduated and became an Orderly at the Hospital. “I love my work. This job is the reason I live today – for my patients. I believe that every one of us has to go on a journey to find their purpose in life; this was my journey. 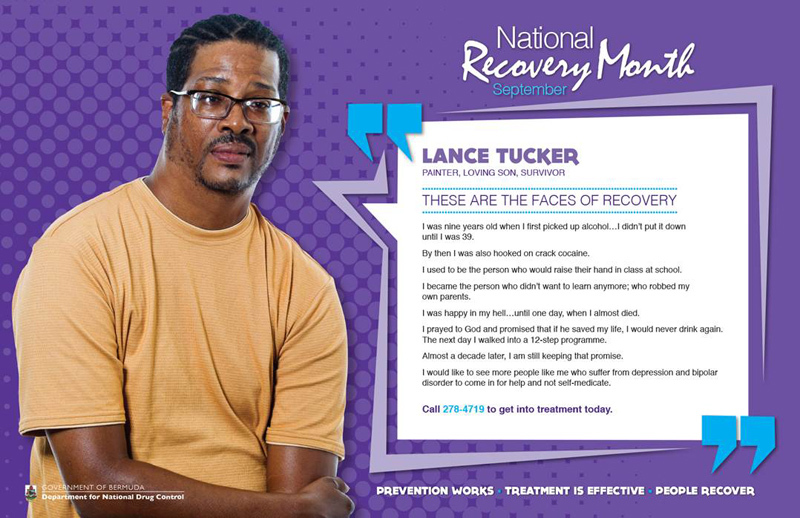 Painter, loving son, and survivor Lance Tucker said, “I was nine years old when I first picked up alcohol. I didn‘t put it down until I was 39. By then I was also hooked on crack cocaine. “I used to be the person who would raise their hand in class at school. I became the person who didn’t want to learn anymore; who robbed my own parents. I was happy in my hell… until one day, when I almost died. “I prayed to God and promised that if he saved my life. I would never drink again. The next day l walked into a 12-step programme. Almost a decade later, I am still keeping that promise. Father, plumber, former sportsman, and survivor Winslow Williams said, “As a youngster, I had a lot of promise. I was an upcoming local cricket and soccer star. “Then, at 24, I started taking cocaine, giving in to peer pressure. It quickly became my habit… and stayed that way for many years. I was clean for five years until I relapsed in 2017. “This relapse led to behavior which landed me in prison. Only a few weeks before that, I had become a father for the first time. “Not being with my baby girl has been devastating. She will turn one next month and I have already missed so much. I have now been clean for ten months. “The Right Living Program here in prison has changed my thinking patterns and behavior; teaching me coping skills and how to live life on life’s terms. Here at Right Living we are all like a family, keeping each other accountable. “I have to get myself together first in order to be there for my daughter. 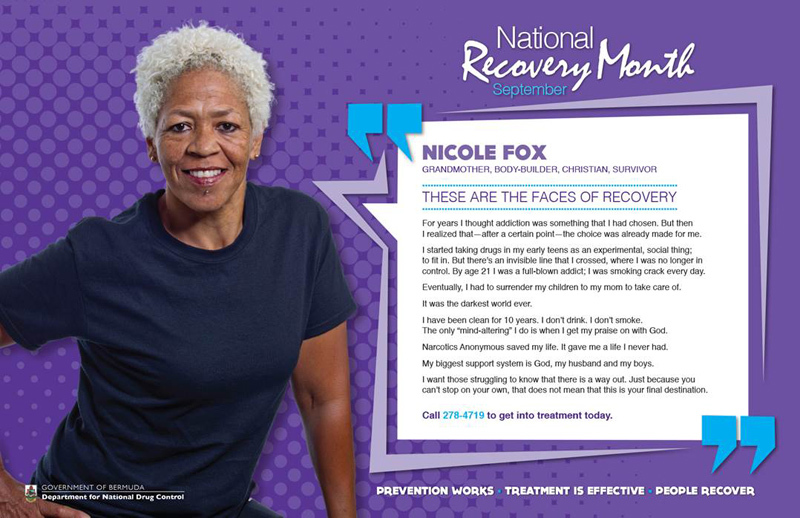 Grandmother, bodybuilder, Christian, and survivor Nicole Fox said, “For years I thought addiction was something that I had chosen. But then I realized that – after a certain point – the choice was already made for me. “I started taking drugs in my early teens as an experimental, social thing; to fit in. But there’s an invisible line that I crossed, where I was no longer in control. By age 21 I was a full-blown addict; I was smoking crack every day. “Eventually, I had to surrender my children to my mom to take care of. It was the darkest world ever. “I have been clean for 10 years. I don‘t drink. I don’t smoke. The only ‘mind-altering’ I do is when I get my praise on with God. “Narcotics Anonymous saved my life. It gave me a life I never had. My biggest support system is God, my husband and my boys.